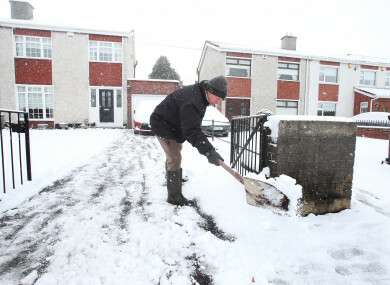 Local man clearing out his driveway in Glasnevin. TESCO IRELAND HAS said that due to the hazardous conditions on roads around the country today, most of its home deliveries will not be made. The “Beast from the East” is affecting most parts of Ireland, with heavy snowfall across the country. Red alerts are in place for Leinster and Munster, with “blizzard-like conditions” to develop over the next two days. While some transport services are still operating, others are not and a spokesperson for Tesco told TheJournal.ie that given the driving conditions in red alert areas, it is unable to complete the majority of deliveries. The spokesperson said: “We’ve been in touch with customers to let them know directly. We apologise for the inconvenience caused. As it stands our stores are open but we’re keeping a close eye on the weather. We’ll be posting updates on social media throughout the day to keep customers informed. A spokesperson for Supervalu, meanwhile, told TheJournal.ie that it is “working hard on ensuring all online orders are delivered, but this is weather permitting and some customers in affected areas may experience delays”. The spokesperson added: “All of our stores remain open at present, but we are continuing to monitor weather conditions locally. In the event of any cancellations, customers will be contacted directly by the store they placed the order with and we would apologise for any inconvenience. Ultimately the safety of our colleagues and wellbeing of our customers is paramount, and we continue to take guidance from the relevant authorities. Email “Tesco 'unable to make most home deliveries' today due to the treacherous conditions”. Feedback on “Tesco 'unable to make most home deliveries' today due to the treacherous conditions”.